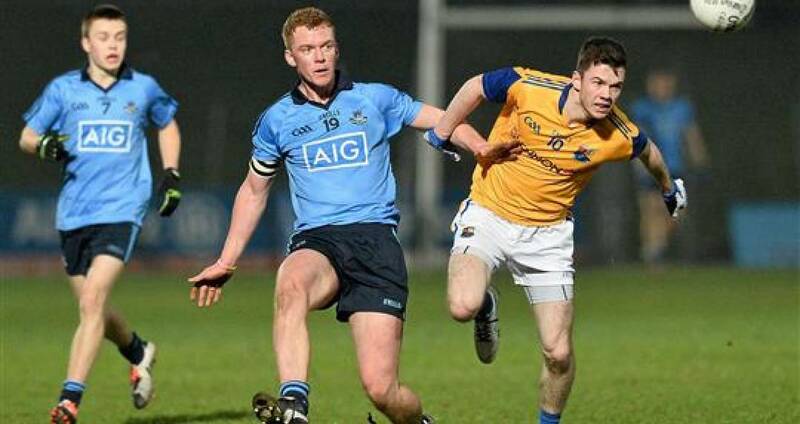 Dublin finished with a flourish to fend off a talented Longford side in Wednesday night's EirGrid Leinster U21FC semi-final at Páirc Tailteann, Navan. The provincial decider against Kildare will take place in Páirc Tailteann, Navan on Thursday, April 2 (7.30). The Dubs mettle was seriously 'road tested' as they overcame their opponents despite the concession of an early goal at the start of both halves and trailed by a point with 12 minutes to play. Then Dublin kicked into over-drive with unanswered points from sub Aaron Byrne, making an immediate off the bench, Eric Lowndes from long range off his left, three excellent Nialll Scully points and the final score from Lowndes saw Dessie Farrell's men into the winners enclosure. While Dublin concluded the game in style they were exposed at times and Longford, especially in the opening half, showed a very clinical edge with corner-forwards Liam Connerton and Larry Moran in fine form. The midlanders made the dream start when Moran goaled after an incisive run in along the endline in the second minute. While Killian O'Gara's fifth minute goal cancelled that out following unselfish play from Colm Basquel Dublin were again on the back foot when Connerton raised a green flag in the 13th minute to put his side 2-1 to 1-1 ahead. Dublin responded with three points from the highly influential Conor McHugh and when Eoin Murchan brilliantly found Basquel, who held his nerve close to goal to finish to the net, the Dubs moved two points in front. By the interval Dublin were the minimum in front, 2-5 to 2-4, but Longford quickly tipped the scales in their favour with Connerton's second goal in the second minute of the second half. However, much as they had against Laois in the first round Dublin rallied with points from Basquel, McHugh (two) and the hard-working Andrew Foley, following a clever tap down from O'Gara as the boys in blue took control in the middle third of the park. Typical of the game Longford were far from finished with three points in the next six minutes edging them in front. This set up a grandstand finish from the Dubs with sub Byrne showing his pace before slotting over to ignite his side's push for victory with Scully showing great leadership to drive Dublin on with three points and set up a provincial decider against Kildare on Thursday, April 2. SCORERS - Dublin: K O'Gara 1-2, C McHugh 0-5 (0-1f), C Basquel 1-1, N Scully 0-3, E Lowndes 0-2, A Foley, A Byrne 0-1 each. Longford: L Connerton 2-1, L Moran 1-1 (0-1f), P Kiernan 0-2, A Dalton, D McGivney (0-1f), D Reynolds 0-1 each. DUBLIN: L Molloy; S Clayton, D Byrne, R McGowan; E Lowndes, C Mullally, E Murchan; Stephen Cunningham, S Carthy; G Burke, A Foley, N Scully; K O'Gara, C McHugh, C Basquel. Subs: R Gaughan for Burke (43 mins), A Byrne for O'Gara (47), M Deegan for Basquel (60). LONGFORD: C Farrell; R Sweeney, A Farrell, C Shields; L Sullivan, C Farrelly, D Reynolds; F Sheridan, A Dalton; R McNerney, S Kenny, R Connor; L Moran, P Kiernan, L Connerton. Subs: D McGivney for Sheridan (26 mins), P Farrell for A Farrell (52), N Rabbitte for Kiernan (56). The Dublin minor footballers face Kildare in the Leinster MFL Final this Saturday afternoon (12.0) in Hawfield, outside Newbridge. The Dubs narrowly beat Meath last Saturday in their semi-final in Parnell Park (0-11 to 0-10) with an injury-time free from Callum Pearson while the Lilywhites comfortably overcame Carlow in their semi-final.